One hundred and forty four people died in the Aberfan disaster 50 years ago this week—including 116 children. Yet no one has been held accountable. This was not simply an awful accident. It flowed from a policy backed by both Labour and Tory governments. On 21 October 1966 a coal tip collapsed and slid down a mountain into the South Wales village of Aberfan. It smashed through a farm, a junior school, part of a senior school and several houses. People were buried alive before they had time to understand what was happening. Gaynor Madgwick was eight years old and in Pantglas Junior School on the day of the disaster. Two of her siblings, Carl and Marylyn, died in classrooms either side of her. In a new book on the disaster and its aftermath, Gaynor describes how “360,000 tons of colliery waste” shot down the mountain towards the school. A spring underneath the tip had made it more unstable. “When it filled with water, it became something like ready mix concrete,” wrote Gaynor. “A deadly sludge carried on a thin sheet of water. Each case should be reviewed to ascertain whether the parents had been close to their children and were thus likely to be suffering mentally. A 13 year old schoolboy described seeing “a big wave of muck” with “trams, trees, trucks, bricks and boulders in it”. Coal waste filled the classrooms and Gaynor was trapped under a pile of rubble. “Children were screaming,” she wrote. Ordinary people rushed to help in the aftermath of the disaster. Residents and others joined the rescue efforts. By Saturday an estimated 2,000 volunteers had arrived. A disaster fund raised around £1,750,000 with donations coming in from across the world. This response was in stark contrast to how survivors and the bereaved were treated by officials. It took Lord Robens, the chair of the National Coal Board (NCB), 36 hours to reach Aberfan. On hearing of the disaster he chose to stay in Guildford where he was being installed as chancellor of the University of Surrey. This didn’t stop the NCB telling the government that Robens was personally directing relief work. The NCB paid £500 compensation to each bereaved family. It called this a “generous offer”, having originally offered £50. Gaynor wrote, “It was little more than the amount paid out per farm animal”. The Charity Commission recommended that the disaster fund pay £500 to each set of bereaved parents. The fund’s management said it should be £5,000. The Labour government under Harold Wilson raided the disaster fund in 1968 to help pay to remove the tips above Aberfan. These tips were known to be unsafe and shouldn’t have been there in the first place. A lengthy campaign finally got the money refunded nearly 30 years later. But inflation would have increased the value of the money 12 times over. Children were screaming. Bodies lay crushed and buried and the survivors lay looking at their best friends, dead. Veteran BBC broadcaster Vincent Kane reported on the disaster and its aftermath. He told Socialist Worker, “Half a dozen or so organisations or individuals should have brought help to those stricken people, but instead they betrayed them. “It was because the surviving community resisted or objected to what these organisations were doing or trying to do to them that they came to be seen generally as ‘the problem’. “The organisations were the problem and survivors were the victims. The 1967 Tribunal Inquiry into the Aberfan Disaster found that the NCB had no tipping policy and that it had legal liability for compensation. Yet the NCB faced no corporate sanctions. No one was prosecuted for manslaughter or any other offences. No one was dismissed or demoted. But people in Aberfan were clear who was responsible. At an inquest into the deaths of 30 of the children, the coroner gave the cause of one child’s death as asphyxia and multiple injuries. Professor Iain McLean has written about the disaster. He says the failure to hold anyone to account was “rooted in the ‘high politics’ of the 1960s and 1970s”. Iain told Socialist Worker that a government policy of pit closures made NCB chair Lord Robens feel “indispensable”. “Governments of both parties thought that the NUM was a dangerous enemy to have,” explained Iain. But they wanted the coal industry to be “slimmed down”. “And the only person they could trust to do that without provoking mass strikes was Alf Robens. Vincent Kane explained how Robens was helped by some officials at the National Union of Mineworkers (NUM). “On pit closures the facts speak for themselves,” Vincent told Socialist Worker. “Lord Robens became chairman of the Coal Board at roughly the same time as Will Paynter became general secretary of the NUM. “At that time there were 698 pits in Britain with 583,000 miners. When they both left office ten years later there were 292 pits and 283,000 miners. Vincent said that safety problems with tip number seven above Aberfan were ignored because of this policy. “Robens formed a close working partnership with Paynter,” he said. “Robens convinced him that the only way to save the coal industry in the long run was to close pits that were ‘uneconomic’ or ‘problematic’. “Coal Board officials, managers and engineers at Merthyr Vale colliery were keenly aware that the pit would become exceedingly ‘problematic’ if tipping had to stop. Robens offered his resignation to the government following the inquiry into the disaster. But the minister of power Richard Marsh rejected it. It was all a sham. Robens had demanded to see the inquiry before it was published. Iain said Robens “immediately orchestrated a campaign of support for himself” among NUM branches. Vincent said it was “most significant” that the government kept Robens on. He was protected because it was said he was “doing a good job and he was the only man who could do it. Robens did so well that in 1970 he was appointed chair of a government committee—looking at health and safety at work. 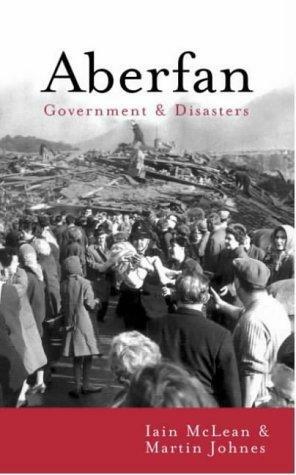 Iain McLean and Martin Johnes’s book, Aberfan— Governments and Disasters, looks at the similarities between Aberfan and other tragedies, such as Hillsborough in 1989. Robens initially told a reporter that “it was impossible to know that there was a spring in the heart of this tip”. But the spring is marked on Ordnance Survey and Geological Survey maps. Many Aberfan residents recalled swimming in it. The inquiry found Robens’ claim to be false. It condemned a “failure to heed clear warnings” and found evidence of long running worries about the stability of the tip. The NCB’s Area Mechanical Engineer sent letters to the local authority about the danger posed by the tip. One, dated 24 July 1963, said the NCB “appear to be taking slurry up to the existing tip at the rear of the Pantglas Schools”. The same engineer wrote to the NCB on 20 August. This letter referred to “apprehension” among Aberfan residents about the potential for the tip to move. The Aberfan tips had slid in 1944 and 1963. But the NCB spent days at the Tribunal denying the 1963 slide ever happened. At 76 days, the inquiry was the longest running of its kind at the time. Iain said, “The coal board tried to deny responsibility throughout the inquiry. It could have admitted liability on day one. Robens only deigned to appear close to the end to admit that the NCB had been at fault. The Tribunal called Robens’ behaviour “nothing short of audacious”. It supported a comment by Desmond Ackner QC that NCB bosses acted as though they had “no more blameworthy connection than, say, the Gas Board”. For some, the denigration of the NCB was a golden opportunity to advance their own agendas. Margaret Thatcher, Tory power spokesperson at the time, criticised the NCB in Parliament. Her conclusion? “It is a jolly sight easier to exercise control in private industry”.